An interesting article appeared over the weekend (Saturday, March 20, 2010) discussing the upcoming installation of a new bishop at the Corpus Christi Cathedral in Corpus Christi, Texas. 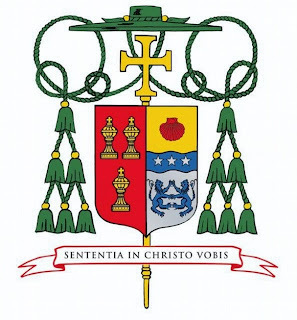 Among the other items discussed in the article (which can be found on-line at http://www.caller.com/news/2010/mar/20/changing-of-bishops-steeped-in-ceremony/) are the new bishop's cathedra (chair, or throne) and his coat of arms. "The upper portion is gold with a red scallop shell taken from the coat of arms of Pope Benedict XVI, also a symbol of baptism. The lower portion has two blue lions taken from Mulvey’s family coat of arms. A blue wavy bar across the center represents the Colorado River that runs through the Diocese of Austin, where Mulvey served for 35 years. The bar has three silver stars that symbolize the Holy Trinity."